We designed an apartment for a young family with modern aesthetic. This is 1600sq ft apartment with 3 bedrooms. For our portfolio we shot only the living spaces, but the renovation included all 2.5 baths and the kitchen. With two super active boys, all selections had to stand the test of time. From modern sleek lighting to wide plank flooring, french doors and a feature panelled wall, this is a project we turned around in record time. Photography by Daniel Wang. This generous living room really is the gathering spot of the home. With the super active boys, we used leather and dark grey upholstered sectional in sunbrella fabric. The accent chairs are the only delicate things in the room but with those beautiful curves, we coulnd't stay functional. The black elephant grounds the room in an assymetric way and we love that purposeful design. This is the multipurpose room which extends from the living room - its the guest room, playroom, reading room and of course the TV room. 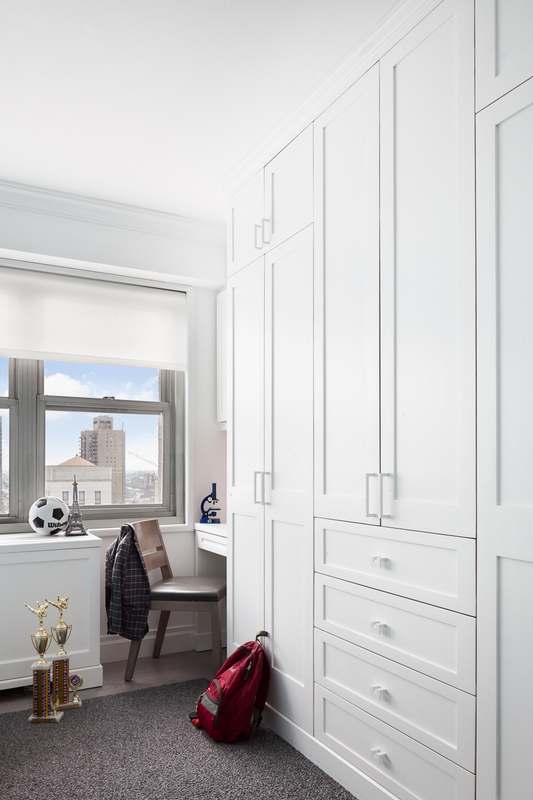 With all the storage from these custom built-ins we designed, guests and kids have plenty room to expand beyond their bedrooms. The classic shell chair becomes the highlight of the reading / drinking nook. Keeping with the black and dark moody greys throughout the house, we bring in the black and white zebra art. The art pulls together the room with the dark grey swivel chair making it the perfect spot for that morning cuppa joe. I love the slight peek into the custom dark wood walk in closet and the minimal black sconce we selected for lighting here. The crisp white quilt with the bright chartreuse is the perfect pop of color without being too obvious. We anchored the dining room (not with a rug) but with a feature wall. We did custom square panelling creating a grid pattern and accented the room with a bright blue paint, a bold move. The Quartz top dining table is indestructible and beautiful at the same time. We love these dining chairs that add curves to the room amidst the geometry from the panelling. The assymetrical ceiling fixture provides a subtle movement to the design. The swivel chairs with the matching blue upholstery are details we live for. Kids room fitted with individual desks separated by built ins for days.... functional as it keeping the brothers far apart so they can focus on the job at hand. We created symmetrical closets for both the boys and a centre panel with drawers and more hanging space for additional storage of all kinds. We wanted the millwork to be a feature and hence brought in white hardware that disappears. The beautiful oak chairs bring in some warmth.